Back in 2012, a little brewpub in Long Beach called Beachwood BBQ & Brewing bottled its Russian Imperial Espresso Stout called Tovarish for the first time. I recall nabbing the sleek bottle one brisk winter evening at Bruery Provisions (rip) and not stopping until the entire 22oz bottle was empty. Not only was the buzz from an 11+% alcohol beer intense, the caffeine in the beer made my ears tingle. I imagined, just for one second, that this is what smoking crack must feel like. Back for its sixth release, Tovarish is back with a vengeance. Not only is the beer made in Huntington Beach, with coffee beans roasted by Portola Coffee Lab, it’s presented in glorious aluminum cans for the first time, proving the death of the 22-ounce bomber as a beer format. No more silly wax to peel, no more need for a bottle opener…this beer is ripe and ready for the drinking. Fresh from Beachwood’s new Wild Goose canning line, brewer/owner Julian Shrago notes, “I have always recommended consuming Tovarish fresh. Very few beers improve with age and coffee doesn’t tend to have long-term stability in any beer.” I tend to agree. Although the tendency is to want to age a big stout, any beer with coffee (or fruit) should be enjoyed fresh because coffee in beer can take on an ashy quality over time. In Tovarish, the coffee character is extremely ripe, with sweet-juicy sugarplum characteristics wrapped in a fuzzy espresso ushanka (Russian earflap hat). Cocoa, roasted malts, and notes of Raisinettes finish out the weighty liquid. Previous years’ releases seemed much more coffee-forward, whereas this one is a perfect harmonious marriage of roasted bean and grain. It seems more cohesive, not like a coffee beer, or a beer with coffee. Together, they create their own new flavor. Beachwood’s secondary Tovarish release—with chocolate, vanilla, cinnamon, and serrano chili—amps up the flavor times four, with sort of a spiced, Mexican hot chocolate vibe. It carries a bit of Scoville heat on the finish from the pepper, but overall a nice balance of stout and spice while keeping it firmly out of pastry stout territory. Overall, Tovarish is one of those beers that should be on your radar like a SpaceX launch, where at first glance it appears like a cold war nightmare, yet ends up being a true spectacle of what modern man can create. 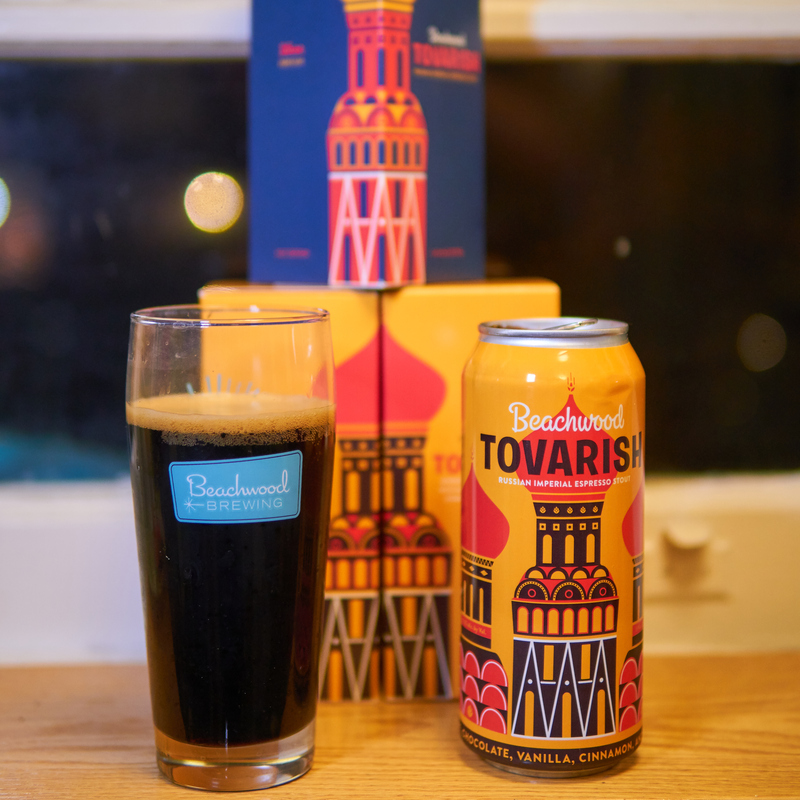 Beachwood Brewing Tovarish Russian Imperial Espresso Stout and the variant is available at all Beachwood locations until it runs out! Locations and info at beachwoodbbq.com.